Organizing jewelry and accessories is one of home organizing riddles. The idea of organizing them properly in a practical order and in a place that we can use them everytime is always challenging. Recently I've decided to use a dreamcatcher for my long earrings, which are plenty and always end up in a box untidy. Here I share with you a big list of everyday items and diy ideas that everyone can make and use easily to organize all the jewelry (necklaces, bracelets, earrings, etc). Dimitra Decorasylum 20 Μαΐ 2015, 8:58:00 π.μ. beh1nd 20 Μαΐ 2015, 4:38:00 μ.μ. Πωωωω θέλει πολύ ξενύχτι το ζήτημα!!! Ζημιά είσαι!!!! DIMI 20 Μαΐ 2015, 4:53:00 μ.μ. Πολύ όμορφες ιδέες Ιωάννα μου! !Εχω πολλά σκουλαρίκια καί μονίμως τά χάνω!! Μού άρεσε φοβερά η ονειροπαγίδα! !Καλή εβδομάδα! !Πολλά φιλιά!! M. Akamatra 20 Μαΐ 2015, 10:21:00 μ.μ. 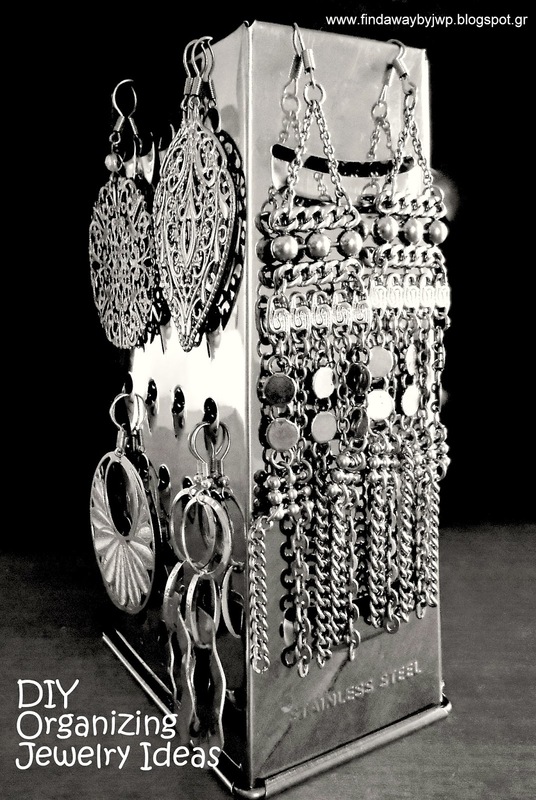 You know I have the same problem with my own jewelry and the one thing that seems to work for me is several different boxes so they don't get tangled. I just can't seem to find the perfect solution but I am always up for new ideas so I'll be checking out all your links! Thanks so much for sharing! Vasso D 21 Μαΐ 2015, 3:03:00 μ.μ. Food for thought, imagination and creation!!! Zina Z 21 Μαΐ 2015, 3:27:00 μ.μ. Katerina Konstantinou 31 Μαΐ 2015, 12:56:00 μ.μ. Αμάν επιλογές και έμπνευση! Πολύ όμορφες ιδέες Ιωάννα! Καλή και η χρήση της ονειροπαγίδας από τις πιο πρωτότυπες που έχω συναντήσει!